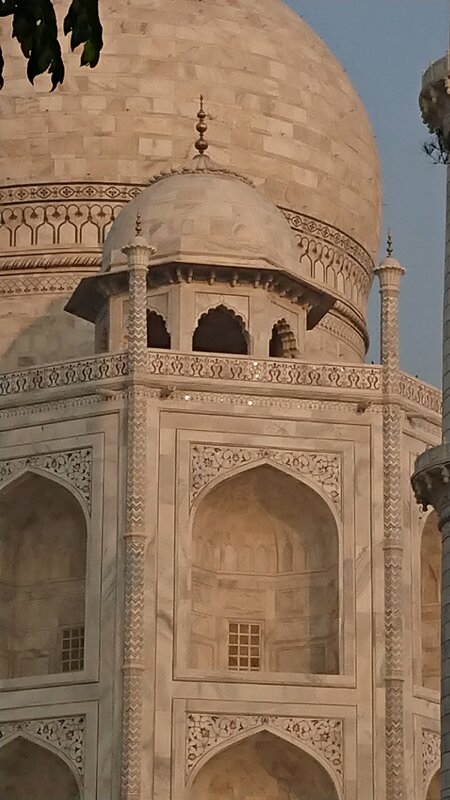 Our day in Agra began very early with a visit to the Taj Mahal at sunrise. 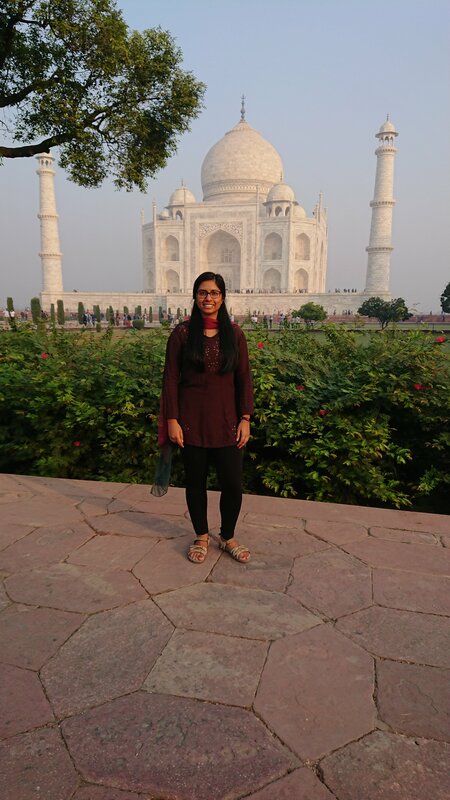 As the most iconic attraction in India and one of the seven wonders of the world, it was high up on my bucket list! 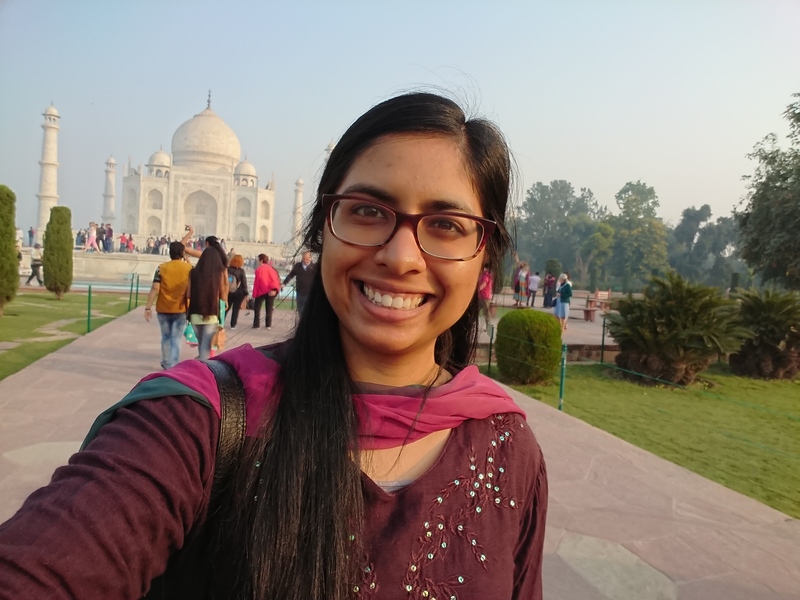 Yay – Me outside the Taj Mahal! 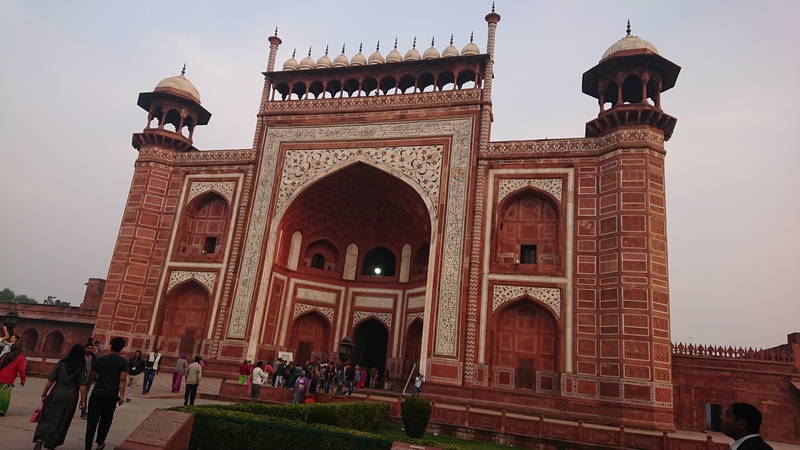 We entered through the great gate, decorated with Islamic verses inlaid in black stone into the pristine white marble. In a clever bit of trickery the letters at the top are actually bigger than those at the bottom so that when you look up at the vast structure, all of the writing appears uniform. 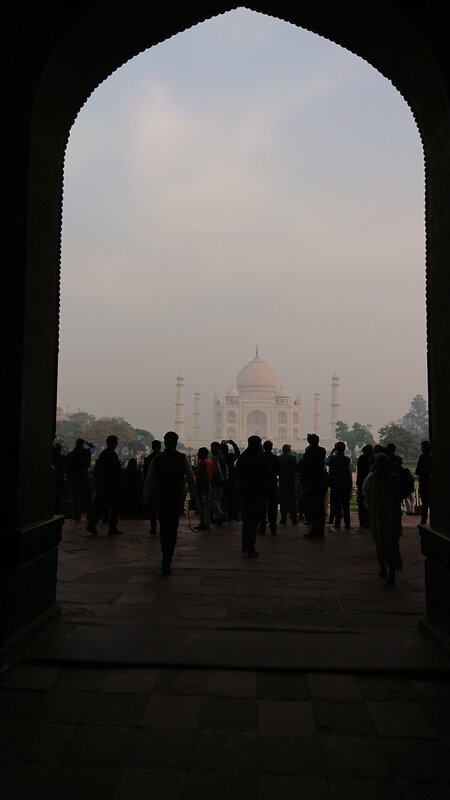 Passing through the gate, we got our first glimpse of the Taj Mahal in the distance (although even at that time in the morning there were plenty of visitors crowding to get that perfect centre-line photo. Not quite centre but it’ll do! The Taj Mahal was built by Mughal Emperor Shah Jahan in the 17th century as a memorial to his wife who dies giving birth to her 14th child. It took 22 years to complete (the domes on the main gate representing each year) and over 22,000 workers. 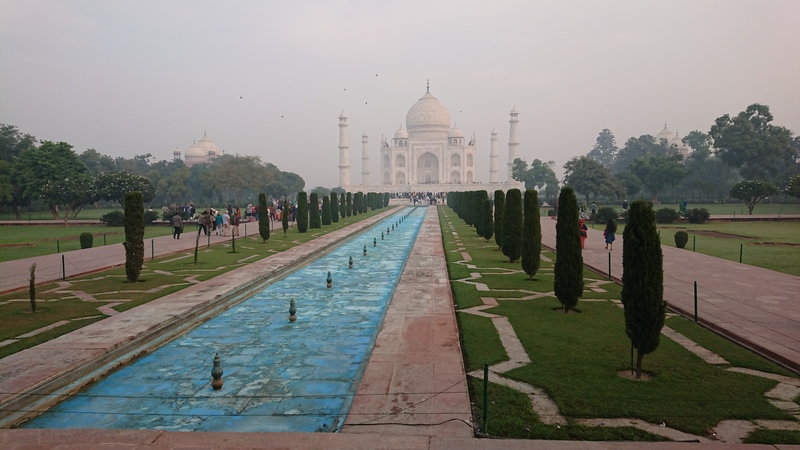 Built entirely from white marble which glows in the changing sunlight, the Taj Mahal is encrusted with thousands upon thousands of precious stones such as jade, amber, ruby and cornelian. 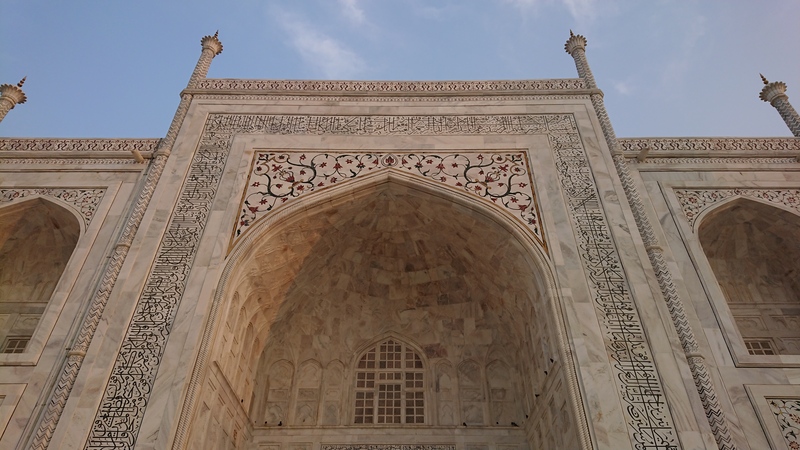 Each stone was shaped precisely by hand using a grindstone and file which inevitability led to many workers cutting their fingers while tirelessly working on their masterpiece. 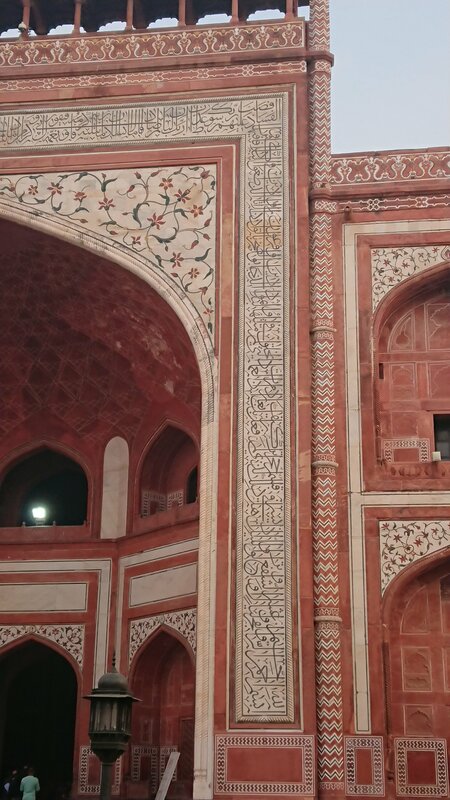 This led to the myth that Shah Jahan cut off the workers hands or thumbs so that so that they could never duplicate their work again. 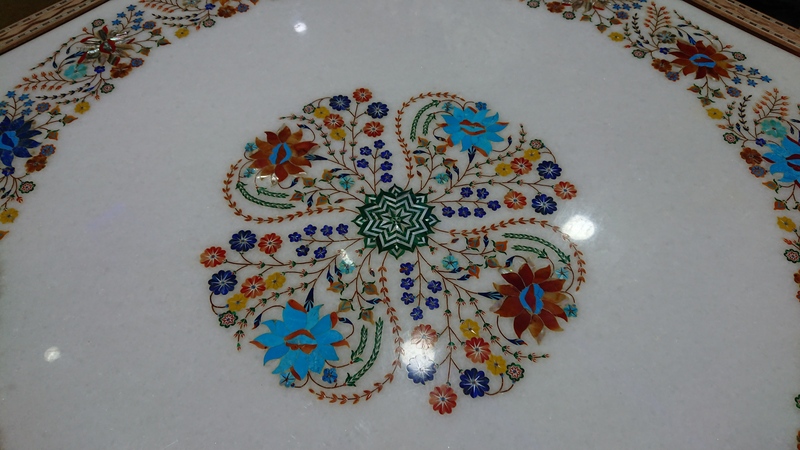 After our visit, we saw a demonstration of the stone carving and inlay craft, called Pietra Dura, traditionally passed down from father to son. 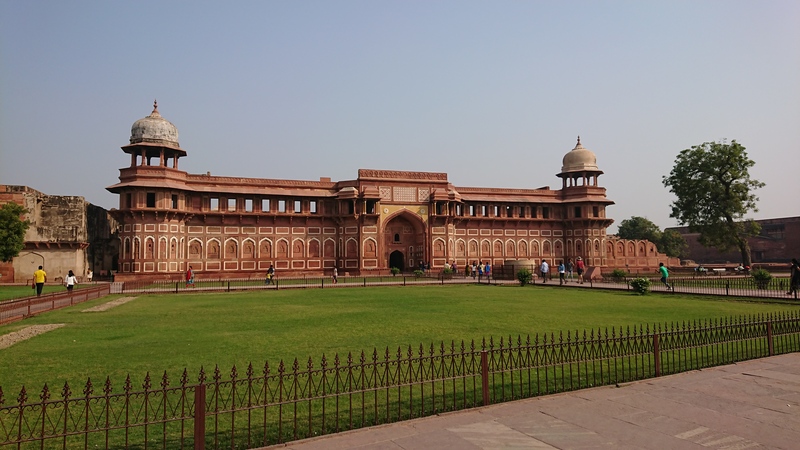 We also visited Agra Fort, built by Emperor Akbar in the 1500s as his main residence. 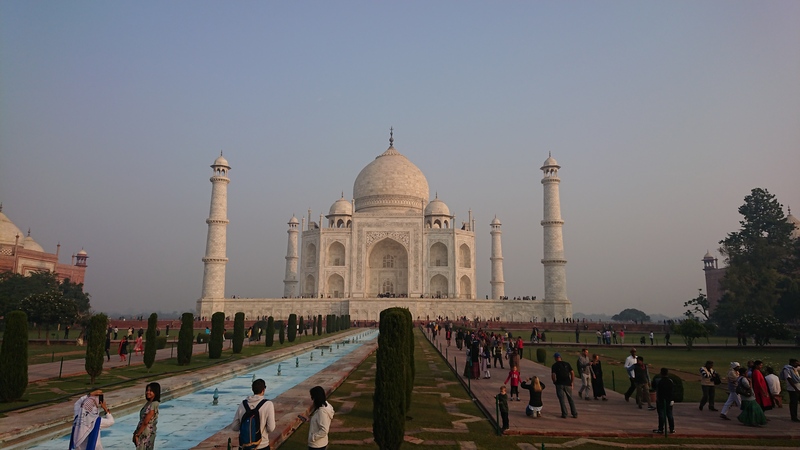 Mughal emperors continued to use the Fort and Shah Jahan was imprisoned there for the last few years of his life. He could see his beloved Taj Mahal across the river from his ornate golden room and was buried next to his wife after he died.